The Highlead GK600-4 is the cylinder arm version of Highlead's high speed cover seam (seam-cover) machine. The machine can be used for full top & bottom cover or you can choose to do bottom only cover. The option of using 2 or 3 needles is also available for different sewn finishes. It has many outstanding features such as easy adjustment of bottom differential feeding, easy stitch regulation and easy threading etc. The general purpose GK600-4 model is suitable for sewing operations such as hemming, covering or decorative stitching on light to medium weight fabrics. Special sub class models are also available for dedicated operations such as binding etc. As well as cover seam sewing the versatile cylinder arm design is useful when stitching smaller radius operations such as arm or neck holes etc. The fully sealed bottom sump is equipped with automatic oil lubrication and filter system; which enables the machine to run smoothly with low noise and vibration. Optional attachments are available which increase the machines versatility and uses include: cover lap seaming, covering seaming and decorative seaming for underwear, sportswear, T-shirts, knitting fashion etc. Highlead Model GK600-4 = basic general purpose version supplied on unit stand with single phase clutch motor. Highlead Model GK600-4-B = Binding operations (pre-fitted with dedicated binding sewing equipment). 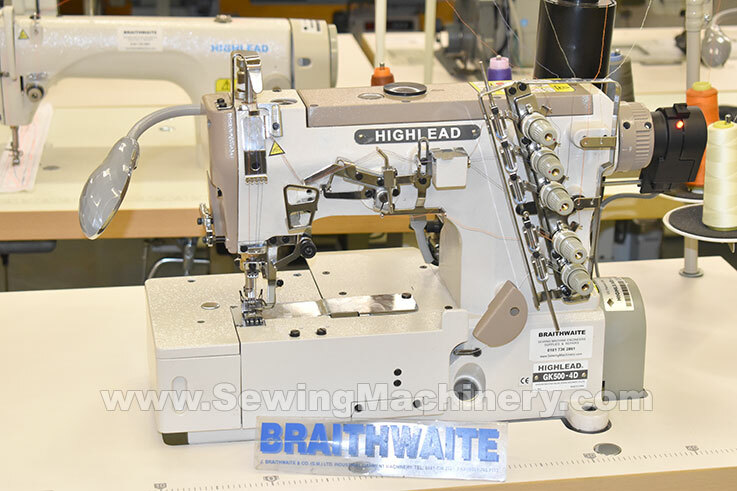 Highlead Model GK600-4D-TT = automatic version which features auto under bed thread trimmer, auto top cover thread trimmer and electronic needle position motor with the option to add other devices i.e. auto foot lifter. photo of GK600-4D-TT with automatic thread trimmer and electronic control.